What’s the first thing you think of or feel when you hear the word ‘antidepressant’? For some reason, there’s a whole load of stigma and fear around them. A lot of people worry that they ‘change who you are’, or even think they somehow mean you’re ‘cheating’ at recovering from a mental illness. With Time to Talk day just around the corner, I want to try and dispel those myths and talk completely openly about my own journey with antidepressants. I’ve always believed that being open and talking about these things is the best way to combat misconceptions around mental health issues. Let’s start with the basics. Antidepressants are medications used to treat a range of conditions, including depression, OCD, anxiety and PTSD. Some antidepressants can also be used to treat chronic pain (NHS, 2018). According to the NHS, it’s thought that antidepressants work by increasing the levels of neurotransmitters in the brain. Neurotransmitters such as serotonin and noradrenaline can impact a person’s emotions. They are generally only prescribed, however, when other treatments like therapy have been tried and were unsuccessful. There are a few different types of antidepressants including SSRIs, SNRIs, NASSAs, MAOIs and TCAs. SSRIs – or selective serotonin re-uptake inhibitors – are the most commonly prescribed nowadays (NHS, 2018). Examples of these are Fluoxetine (commonly known by the brand name Prozac), Citalopram (or Celexa), and Sertraline (Zoloft). When neurotransmitters such as serotonin are released into the synapse (the space between two neurons), they cause elevated mood. The problem is, serotonin can be re-absorbed back into the neurons. If too much serotonin is re-absorbed, a person can be left with too little of it in the synapse to create that positive mood. Often in conjunction with other factors, this is thought to be a cause of depression. SSRIs are basically thought to block the channels that serotonin is re-absorbed through, meaning more of it remains in the synaptic cleft where it can work its magic. Little disclaimer here, these last 2 paragraphs are based on my limited memory of A-Level Biology, so don’t quote me on it. I’ve always been interested in antidepressants and battling misconceptions associated with them, because I have been taking them myself for (on and off) 5 years. Please note I can only speak for myself here – everyone’s experiences with antidepressants are unique and can be very different. There is so much fear and prejudice around this subject but, for me, my experience of antidepressants has been on the whole very positive. Without them to help me, I would without a doubt not be where I am in life right now. I’ve shared my experiences with depression/anxiety plenty of times (if you want to know more, read my blog post here). I was first diagnosed with depression by my GP when I was 16. By this point, I’d been having counselling for some time and, although it was nice to talk to someone impartial, it didn’t seem to be making a huge difference overall. I think this, as well as my quite severe insomnia, is why I was prescribed an antidepressant straight away. The first antidepressant I was given was dosulepin, a TCA (tricyclic antidepressant). TCAs are an older type of drug and are less commonly prescribed now, but it was hoped that it would help me to sleep a bit better as well as help my mood. I can’t remember how long I took it for exactly, but it did help me sleep better. Unfortunately, it seriously affected my concentration, and I struggled a lot with my first year of A-Levels as a result. The reason I stopped taking dosulepin is because I became convinced that it was causing me to have heart palpitations. In hindsight, this was more than likely just anxiety, but I was convinced I was on the brink of a heart attack and insisted I stopped taking it. That was my first real experience of the health anxiety that has returned several times in the years since. It was at that point I started taking SSRIs – the first being fluoxetine (better known as Prozac) – probably the most well-known antidepressant. There have been a lot of misconceptions out there about the safety of fluoxetine. It has been reported that in a very small number of people, it can cause increased suicidal thoughts, however this is rare. 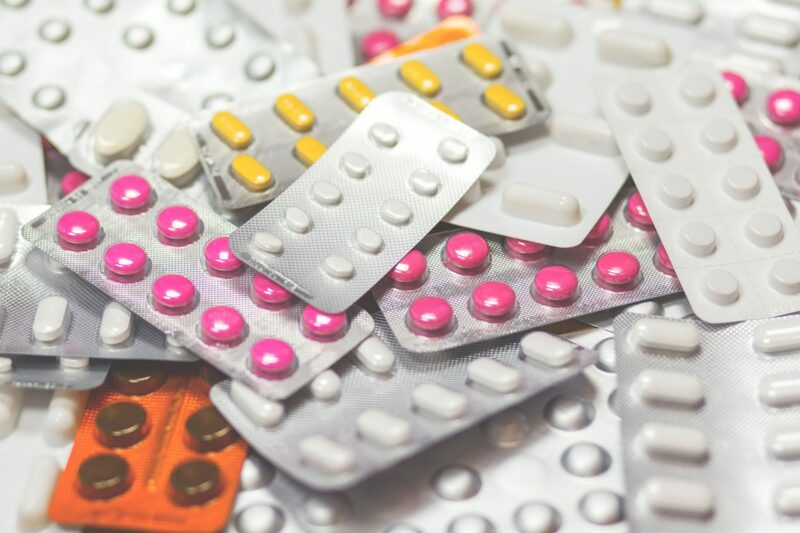 Fluoxetine is one of the most widely prescribed antidepressants (NHS, 2018), and is considered safe and effective, even when taken for a long period of time. I personally believe the bad press it gets is probably because it is the most well known antidepressant, meaning it inevitably gets more press and is simply under more scrutiny than other medications. For me, fluoxetine wasn’t right. If I didn’t take it after food (and sometimes even if I did) I would get the worst acid reflux, which was pretty *minging*. I would also occasionally get weird moments of feeling just really odd. I can’t really explain what it felt like; kind of an overwhelming feeling of panic, usually when I was in bed at night. It would only ever last for seconds, but was quite unsettling. I’m also pretty sure fluoxetine was the culprit behind me being on my period for a month straight (although this isn’t a listed side-effect). Everyone responds differently to different meds, which can mean that finding the right one for you can be a long and frustrating process, but it’s a process worth persevering with, even if it sometimes feels hopeless. More than anything, fluoxetine didn’t seem to be super effective in improving my depression, although this may have been because I took it quite inconsistently. I can’t stress enough though, that all antidepressants work differently for everyone – so please don’t let my experience put you off it. A huge number of people use fluoxetine without any problems, hence why it’s one of the most prescribed antidepressants there is. When I decided to discontinue with fluoxetine, I was switched onto another SSRI called sertraline (also known as Zoloft). Aside from a few side-effects like headaches in the first few weeks, it was quickly obvious that this was the right one for me. It effectively helped me to lift my mood, with very few negative effects on other aspects of my life. This is why, 3 or 4 years later, I’m still taking sertraline. It hasn’t been a constant thing, and I’ve tried to come off it probably 3 times at a guess, but it has never worked out. Health anxiety is usually the first thing to come back when I aren’t taking it, and this is one of the most problematic things for me as it really does take over my life. I also take amitriptyline (a TCA) every night to control my nerve pain, which you can read more about here. Depression and other mental illnesses can be caused by circumstances alone but they can also be caused by physiological chemical imbalances, often a combination of the two. These causes as well as individual differences person to person mean that depression can sometimes be improved, managed or even cured by lifestyle changes, but sometimes it just can’t. This doesn’t mean that someone isn’t trying, or isn’t putting into place strategies to help themselves, it just means that they can’t literally change their own biology. If it was any other illness caused by chemical imbalances, nobody would bat an eyelid. Remember that mental illness is no different. They are physical illnesses of the brain. Sometimes antidepressants are needed for a short period of time and are then not needed anymore. Sometimes they are needed for the long term. Either way is totally normal and fine and no reflection on how much a person is ‘trying’ to recover. Personally, I work on my mental health every day. I exercise, I try to eat reasonably well and I practice mindfulness, and I take an antidepressant every morning. This combination is what keeps me well, and it’s taken a lot of years to figure that out for myself. So before you start patronising someone and throwing out the old ‘you should try exercise’ or ‘you need to eat more omega 3’, consider the fact that people don’t just go on antidepressants as a cop out. It’s something that takes a lot of time and effort to figure out and because of the stigma can be a really hard decision to make. So throwing out suggestions that are really meant to make someone feel like they’re not already trying is really insensitive. Sure, if you see something that you genuinely think might be helpful to a loved one, and that they might be interested in, bring it up. But please stop carelessly throwing about all the same things we’ve heard and tried a million times already. Antidepressants are not scary, they’re not bad and they can and do work. Like any other drug, they have their risks. But I would argue that the stigma and scaremongering associated with them is much more dangerous.Let’s keep talking. If you need to talk to someone about a mental health issue or want to find out more information, you can find a list of helplines and websites on the NHS website here.